Signs you need to polish your fuel. If there is water in the bottom of your primary fuel filter/water separator it is time to get the tank cleaned. The water comes from the fuel tank and is causing corrosion and breeding bacteria that will eventually clog the fuel filters. If there is a gooey black substance in your fuel filters it is bacteria that is living off the water in the fuel tank. The tank will need to be cleaned and fuel polished. If there is black grit in your fuel filters and fuel bowl these are tars that have formed during storage. The fuel is degraded and needs to be polished and the tank cleaned. Will the primary fuel filter remove all the water from the fuel? No. Fuel pick-up tubes typically extend down to about one inch above the bottom of the fuel tank. 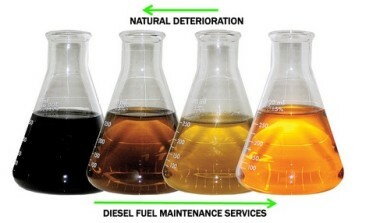 Since water is heavier than Diesel or Bio fuel, water will remain on the bottom of the tank and only a fraction will be removed by the primary filter.